The game of golf is typically seen as a warm weather sport which thrives in sunbelt states, but it is also a vibrant and popular pastime in the Upper Midwest, including Wisconsin and Milwaukee. In 2016, there were over 600 private and public golf courses of different kinds in Wisconsin. In the five-county greater Milwaukee area, there were more than seventy-five courses. These courses included both short (par 3) and regulation courses of nine and eighteen holes. Although golf is an old sport closely associated with Scotland, the game did not begin to grow in the United States until the 1890s. By 1900, most of the estimated 1000 courses were located in the East, but the game had also spread to the Midwest. A year later, there were fifteen golf clubs in Wisconsin. From its early years in the United States two types of golf facilities developed: private country clubs, and public, daily fee courses. Country clubs were designed to furnish an exclusive setting in which members could play the game with their socio-economic peers. Public courses were open to anyone who could pay an inexpensive daily (or greens) fee. Both types of courses emerged in Milwaukee. The first private club was the Milwaukee Country Club, founded in 1895. In its early years, the club occupied different sites on the east side of Milwaukee and in East Milwaukee (Shorewood) before the Milwaukee Country Club finally moved to its present location in River Hills in 1911. A six-hole course in Washington Park became the first public course in Milwaukee in 1906. 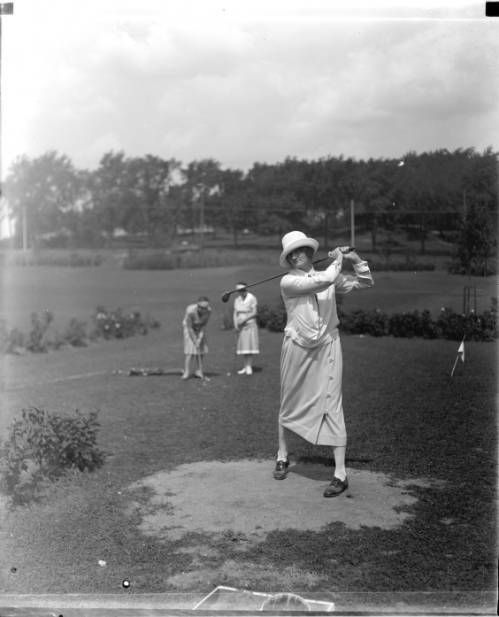 The 1920s saw a dramatic growth in golf in Milwaukee. The County Park System opened the eighteen-hole Grant Park course in 1920 and then added four more eighteen-hole courses during the 1920s and early 1930s. This era also witnessed the creation of several private country clubs in Milwaukee County. Although the Great Depression forced many courses to close in the United States, the game remained popular in Milwaukee. To meet growing demand after World War II, numerous public courses and private clubs were established in the four counties adjacent to Milwaukee County. In Milwaukee, the Park System responded by opening new regulation courses in 1964 and 1971. By 2000, the Park System offered fifteen public golf courses. These facilities included seven short par 3 courses and eight regulation courses of various degrees of difficulty. The crown jewel was the Brown Deer Golf Course, which was a championship facility dating back to the 1920s. Milwaukee and the surrounding area have hosted important national tournaments on a number of occasions. In 1933, Gene Sarazin won the national Professional Golfers Association (PGA) tournament at Blue Mound Golf and Country Club. In 1969, the Milwaukee Country Club hosted the USGA Walker Cup, and in 1951 and 1977 Brown Deer hosted the U.S. Amateur Public Links Championship. The Greater Milwaukee Open tournament was an annual stop on the PGA Tour from 1968 to 2009; in 1996, Tiger Woods made his professional debut at the GMO. 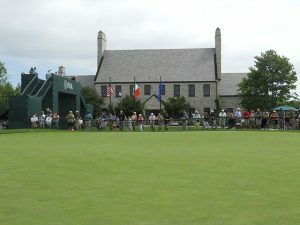 In recent years, major national tournaments have been held at or scheduled for courses near Milwaukee. These include the PGA (2004, 2010, 2015) and the Ryder Cup (2020) at Whistling Straits in Kohler and the U.S. Open (2017) at Erin Hills in Washington County. ^ Golf Link,“Wisconsin Golf Courses: Public and Private,” last accessed April 7, 2017. ^ John Grey and John Schroeder, The Sheboygan Country Club: A Centennial History, 1905-2005 (Virginia Beach, VA: Donning Co. Publishers, 2005), 14-15. ^ Richard J. Moss, The Kingdom of Golf in America (Lincoln: University of Nebraska Press, 2013), 59-60. ^ Milwaukee Journal, April 29, 1969. Gurda, John. A Sense of Tradition: The Centennial History of the Milwaukee Country Club. Milwaukee: Milwaukee Country Club, 1993. Moss, Richard J. The Kingdom of Golf in America. Lincoln: University of Nebraska Press, 2013.